A Starr at Every Turn: Ringo Remastered! Fab sticksman Richard Starkey M.B.E.’s best sides finally get a first-class remastering with Photograph The Very Best of Ringo Starr, a most welcome release that earns Capitol Records a back-off-boogaloo’s-worth of goodwill from fans. For one thing, Abbey Road’s Steve Rooke has given this collection a bright-sounding, widescreen, wide-stereo retooling. For another, Capitol has doubled the number of tracks found on the 1976 compilation, Blast From Your Past. 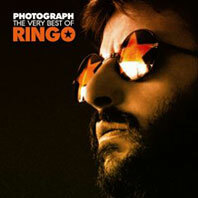 And what’s more, the deluxe edition of Photograph comes with a DVD, resplendent with six Ringo videos and a commercial for the Goodnight Vienna album, which features Spaceman Ringo and Harry Nilsson in his bathrobe. Featuring no less than eight top 10 hits, and Ringo’s spirited duet with Buck Owens on the well-traveled “Act Naturally,” Photograph is a fun listen from start to finish. You get great tunes driven by Ringo’s Ringo-esque vocals and his always stellar drumming. What’s not to love? The collector’s edition of Photograph also nets you the aforementioned DVD. Said DVD might skimp on quantity, but it delivers on the quality front. The videos are fun–“It Don’t Come Easy” and “Back Off Boogaloo” feature very Beatlesque clowning-around in the manner of Harrison’s video for his “Crackerbox Palace”. The animation technique used for the “You’re Sixteen” film is very nice and imaginative, and probably ahead of its time for its time. And the video for Ringo’s duet with Buck Owens, “Act Naturally,” set on an old western film set, is a humorous gem. Look for guest stars Vic “Alice” Tayback as a bartender, and ex-Saturday Night Live player Brad “Mr. Julia Louis-Dreyfus” Hall. Don’t miss the cheesy spaceship prop in the video for “Only You” and the commercial for Goodnight Vienna–the string from which the ship hangs is clearly visible. Shades of Plan 9 from Outer Space! So it’s all down-down-down-down-down-down to Goodnight Vienna for your friend and mine, Ringo Starr. This Photograph really sings. 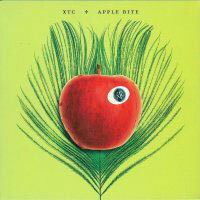 Just released by XTC’s Idea Records, Apple Box brings together the entirety of the Apple Venus project as originally envisioned by the band: a two-record set, one acoustic, the other electric–Apple Venus and Wasp Star all in one place, with their respective demos discs, Homespun and Homegrown, in tow. Apple Box rights the wrongs, and then some. Along with all of the music, you get a spiffy, well-designed 64-page book sporting all of the lyrics to the songs and new notes from Andy Partridge and Colin Moulding (who also provide their autographs on the cover). There’s a surprise that bursts out at you when you open the box; I won’t spoil it here, though (it’s very unexpected and very cool). There’s another surprise: a coupon you mail in so the folks at Idea can send you a heretofore unknown goodie. That’s perfect. I love surprises! Colin’s wistful, breezy melodic masterpiece, “Say It,” is an instant classic, with a warm, affecting vocal performance from Moulding and an extremely satisfying, natural chord progression. Beautiful harmonies, too, adorn this sweet tale of spreading the gospel of love before it’s too late. The lyrics are among the bassist’s best. For example, this tasty verse: “Say it very soon/When you take your tea and toast/Don’t leave the house without saying/Whose toast you love the most.” Very, very endearing, very clever, and very English. Andy’s new song, the lively, poppy “Spiral,” a groovy love letter to the 45 rpm disc and all its magical qualities, is fun all the way, adorned with unique chord changes and varied connecting musical tissue, not to mention a generous sense of humor. The ending is a happy, smiling surprise. Instantly memorable and catchy and classic. A real toe-tapper, this is. 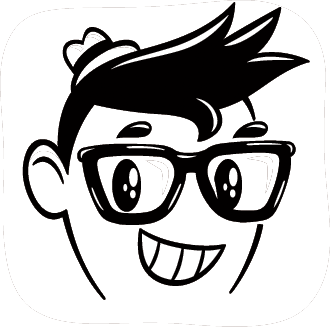 Yes, you have to buy Apple Box to get these very cool and indispensable new songs, and, yeah, I know, you already have all the music, but you don’t have this very nifty collectable, and you don’t want your collection to have a hole in it, do you? Enough said. Plunk down yer cash already. 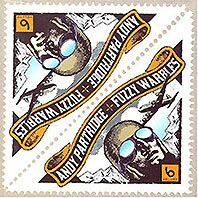 With the release in 2002 of the first few volumes of Fuzzy Warbles discs, another cottage industry–that of illicit Andy Partridge demo collecting–was crushed in its tracks. Suddenly, here were great sounding recordings straight from the man himself–everything from demos to songs offered to, and rejected by, other artists; instrumental weirdness; and other groovy musical trinkets. No more trading of ninth generation dubs necessary. Here was the real thing, and lots of it. Six volumes in, and two more to go to complete the series, Partridge is continuing to come up with collections stuffed to the gills with pearls and diamonds and all manner of heretofore undiscovered treasure. There seems to be no end to the delights being unearthed and passed on, and we are all the better for it. On Volume 5, “I Defy You Gravity” is the keeper, a hit song if ever there was one. Written for, and rejected by, as Partridge calls her, “disco lite chanteuse” Sophie Ellis-Bextor, this vaguely dance-oriented pop song has one of those XTC-ish melodies that defy classification, other than to say it’s catchy as catchy can. And it includes a lyric line that is typically inventive: “Isaac Newton’s annoyed with me.” Of course he is! A keeper of the highest order. More Volume 5 highlights: a fine, tambourine-heavy, four-track demo of Skylarking’s “Earn Enough for Us,” the 007-meets-underwater marching chorus instrumental “Aqua Deum” from the film Ocean’s Daughter; and the majestic, previously-unheard “My Land is Burning,” a criticism of government set against a old-folkish melody. As good as Volume 5 is, Volume 6 is even better per pound. Try on for size the sprightly song written for, but not used in, the film James and the Giant Peach. “The Stinking Rich Song” finds Partridge in fine child-esque mettle, adopting a variety of voices perfect to communicate the thoughts of those who might be…stinking rich. Very clever and fun to listen to. Why XTC didn’t record the wonderful, seemingly-effortless pure pop delight “I Can’t Tell What Truth is Anymore” is anyone’s guess. Scribed for the band’s Nonsuch album, it would have fit well there, or on the second Dukes of Stratosphear release. You won’t be able to get this one out of your head. “Tiny Circus of Life” was used as the title for an XTC greatest hits CD in France, and, lo and behold, here it is the title of a lively, previously-unheard song sporting lots of cool changes and a typically offbeat approach. But wait: There’s more! “In My Hand,” written by illustrator friend Mark Thomas and Martin “Woody” Wood, was recorded by Partridge at the behest of Thomas’ wife for Mark’s birthday. A song that fits snugly in what Partridge calls “masturbators corner,” comprising this and three other demos appearing side by side by side by side here (including Oranges and Lemons’ “Pink Thing”), it’s a well-written, hooky tune with an instantly memorable chorus. You’ll swear Partridge wrote it using a pseudonym. The closing song on Volume 6, “End of the Pier,” yet another orphan from the Nonsuch writing sessions, shines with dance band underpinning and some of Partridge’s best lyrics, and another wish-I’d-written-it melody for the ages. Once again accompanied by booklets featuring Partridge’s song-by-song commentary and adorned by smartly designed, postage-stamp covers magically created by Andrew Swainson, the Fuzzy Warbles series continues to delight. Partridge says volumes 7 and 8 will put an end to the gravy train. I, for one, hope he decides to let the gravy continue to flow. Here’s another in our continuing series of reviews from the pages of our former cyber home, buhdge. Chris Brown’s Now that You’re Fed was the happiest of surprises when it was released in 2006. A masterful soft pop album with gorgeous melodies and harmony vocal stacks that soared higher than high, its songs became staples of the weekly Pure Pop radio shows of the period and are still played on Pure Pop Radio today. I’m pretty sure this is the earliest in a year that I’ve pegged the best-of race’s thoroughbred, but I’m confident in giving this year’s major domo nod to Chris Brown’s Now That You’re Fed, as good a soft-pop album as has come down the pike in eons. It may be only February, but I’m urging you to lay odds on this independent filmmaker’s debut foray into the solo music universe. Yes, it’s that good and, what’s more, it’s even better than that. How much better? Brown has won awards for the work he produces during his day job. I can only assume he applies the same insane level of craft to his songs as he does to the stories he lenses and shows at various film festivals, so accomplished is his work. Brown brings the whole package to the table: incredibly rich, harmony-drenched songs with a world-class poet’s attention to wordplay, textured with just the right amount of instrumentation and the sensitive touch of a vocalist floating butter-light and rich emotion within a hair’s breath of every note. Working with ex-Jellyfish bassist Chris Manning, who co-produced with Brown and also mixed these songs, the singer, the songwriter, the player and, yes, the visionary commingle to grand effect. You’ll hear allusions to Michael Penn, Elliot Smith and others, but make no mistake: Brown is his own man. The secret to Brown’s abilities lies within the brief, quirky “Tummy Ache,” its gorgeous melody rightly sung solo, eschewing any window dressing as it spins the tale of a lover who can attend to the simplest of things–a “pillow for your feet/A glass of water for the table”–but can’t step up to the plate on an emotional platform (“I can’t help you when you wake/I can’t even stop your tummy ache”). Brown’s skill is his way of making his music and lyrics intertwine, work as one, on the same level, and this song is a perfect example of the heights he can and does achieve. The moral of the story? Nothing will truly clean true emotions; nothing can strip truth from an emotional veneer. For his part, the singer is content to step back and not lay his heart on the line: “Visions roll past me as I die/Vacation snapshots past my eye/The day we met down at the Y/You’re silent now, I won’t ask why.” Brown builds to the song’s conclusion repeating the central melody over and over, new thoughts bound to it, exploring more ways out, with an empty din. Indeed, Brown’s way with words is quite sound, which helps to separate him from his peers. These days, lyrics are too often tossed off, or simply inconsequential; no such thing going on here. Along with his wonderful melodies and perfectly-chosen words, Brown shows that he is leader of the pack. This stunning debut proves this in a big way. Essential listening, then. Here’s another in our continuing series of reviews from the pages of buhdge. Hot on the heels of Walter Clevenger’s appearance on Pure Pop Radio: In Conversation during the week of February 10, we present a look at Walter Clevenger and the Dairy Kings’ 2005 album, Full Tilt & Swing. The music of Walter Clevenger is like key lime pie. You may only have it every so often, but when you do, it’s like winning the lottery. Clevenger’s latest effort, recorded, as always, with his mighty excellent Dairy Kings, is the latest winning ticket from an artist who never disappoints. Clevenger brings the same energy level to his records that he and the Dairy Kings bring to their live shows (don’t miss them if they come to your town!). The California-based artist is invested in every note he writes and sings, and his innate sense of melody and what makes a song work is evident throughout Full Tilt & Swing. Mixing elements of rock, pop, rockabilly and a little bit of this and that, Clevenger comes out swinging with the rocking “Love Don’t Mean Anything,” a barnstormer of a creation that ranks among the artist’s best thumpers. Similarly, “The Hurricane” and “Radio Sea” rock hard and fast and get the blood pumping (and, if you’re a listener to my Pure Pop radio show, you know how I feel about radio songs!). The eminently-catchy “Hold On Tight,” buoyed by some typically-great harmony vocals, is one of the standout tracks here, along with the wild and wooly dance hall smash as might be fronted by Buck Owens, “Supermarket Checkout Queen” (you’ll certainly wear out your toes with this one). The lullaby “I’ll Be the One,” pitting a daddy of steel against nighttime monsters, is particularly charming. Clevenger has come a long way since his initial cassette release of PoPgOeStHeMuSiC back in 1995. He has released four other albums since then, and a bunch of tracks for various tribute CD’s. He is always a good play, a guaranteed good time, and you could do no better than to crank up the victrola…uh, the CD player and get the party started. Now, count one off for us, Walter!